-Unfortunately, I had horrible lighting, so the pics aren’t too great :(. -On another note, I head to LA tomorrow! Yay! Time to eat more ^_^. -Right: Fluke sashimi with tangerine snow. -Left: Roasted beet with ricotta cheese and rye toast. -Top: Sweet potato soup with parmesan. 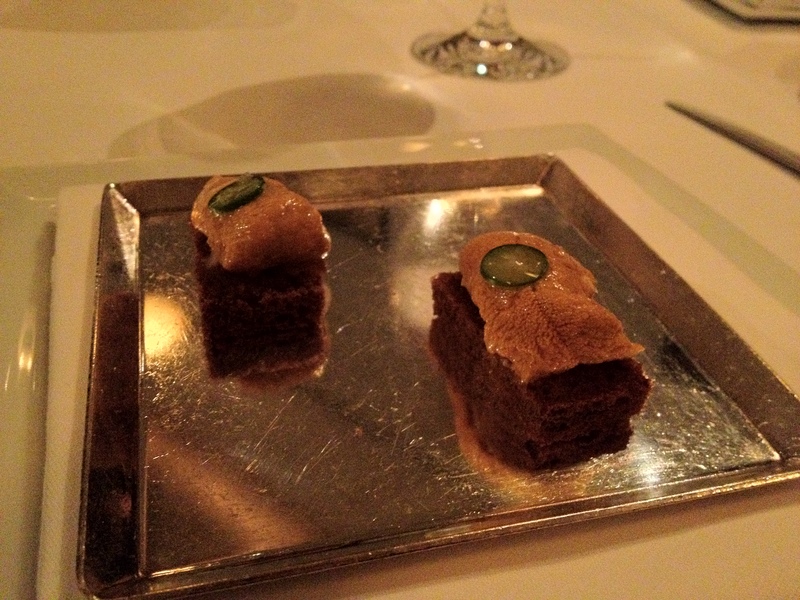 -Uni with toasted pumpernickel bread, yuzu, and Serrano chili. 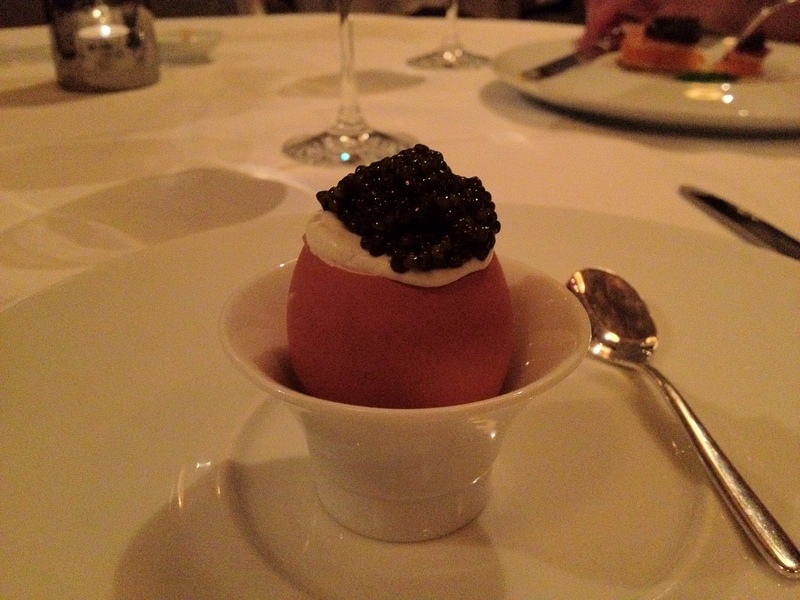 Very lightly scrambled egg topped with whipped cream and Royal Transmontanus Osetra caviar. I looooved this dish. The egg was VERY fluffy, and the egg, caviar, and whipped cream mixed together really well to create a delicious synergy without any single ingredient being too overpowering. I’ve had it a few times before, but I don’t remember it being quite as good as it was today. Maybe it helped that it was a really, really amazing dish that helped me overcome the shock from my final hahaha. Hand-cut spaghetti with white Alba truffles (5 grams) and brown butter. THIS WAS MY FAVORITE DISH. 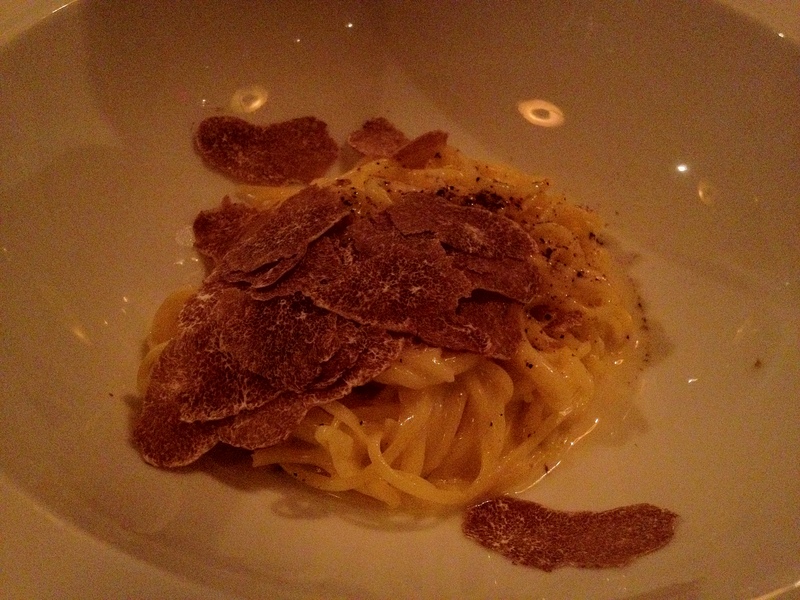 I LOOOOOOOVE truffles, and this pasta had plenty of white truffles. The spaghetti was cooked and seasoned perfectly. You can probably imagine how the dish was. I… couldn’t stop eating it. It was pretty sad to watch it disappear so quickly :(. We got a good portion of pasta, too; that made me quite happy. Sea Scallops, Caramelized Cauliflower, and Caper-Raisin Emulsion. This is one of my favorites from Jean Georges. Everything about this dish was amazing. As always. 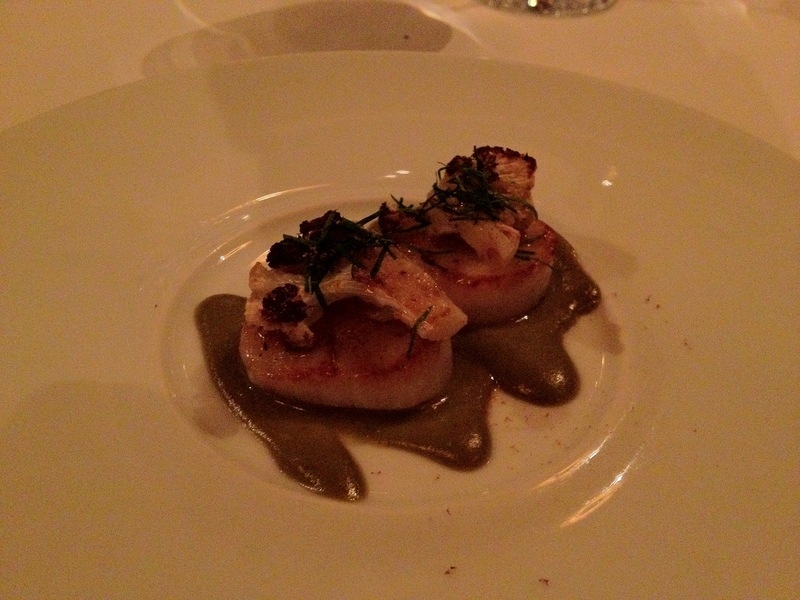 Scallops, cauliflower, and caper-raisin. Mmmmmmm. 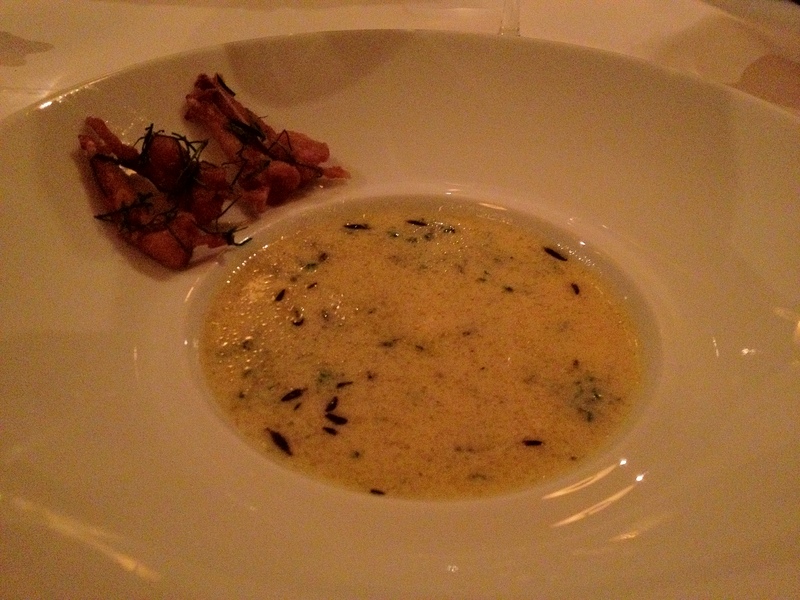 Young Garlic Soup with Thyme and Sautéed Frog Legs. The soup was great, but the frog legs felt unnecessary. I personally didn’t like this dish all that much. 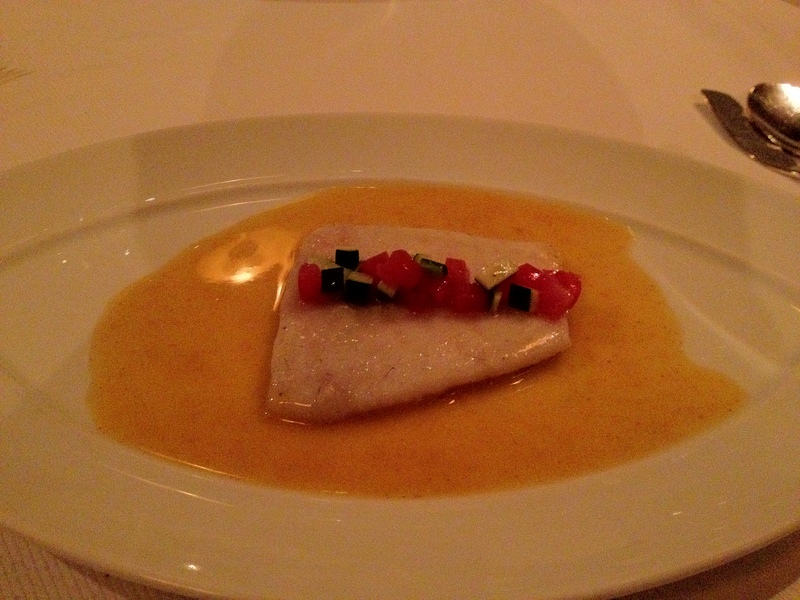 The turbot was well-cooked, but the dish overall just didn’t taste that amazing to me. Lobster Tartine, Lemongrass and Fenugreek Broth, and Pea Shoots. The lobster was great (though it could’ve been slightly more tender). 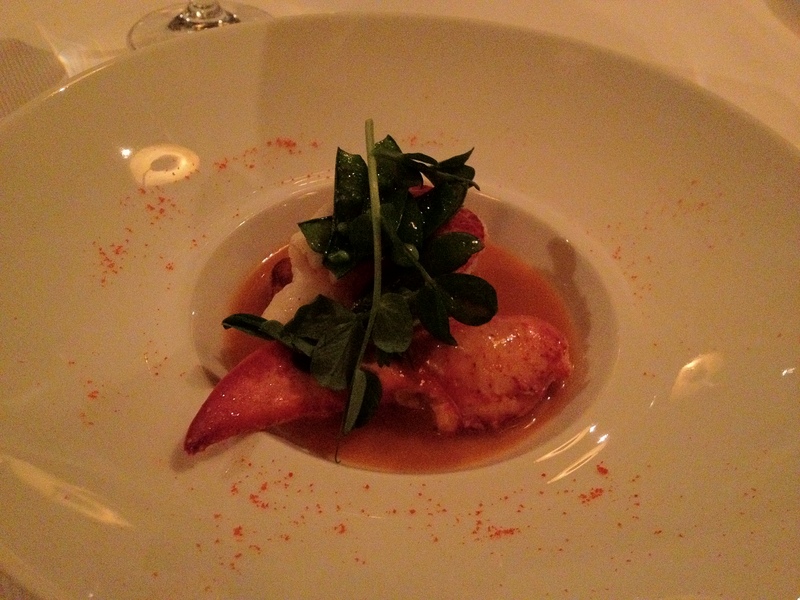 The broth worked REALLY well with the lobster, but the pea shoots didn’t add that much. 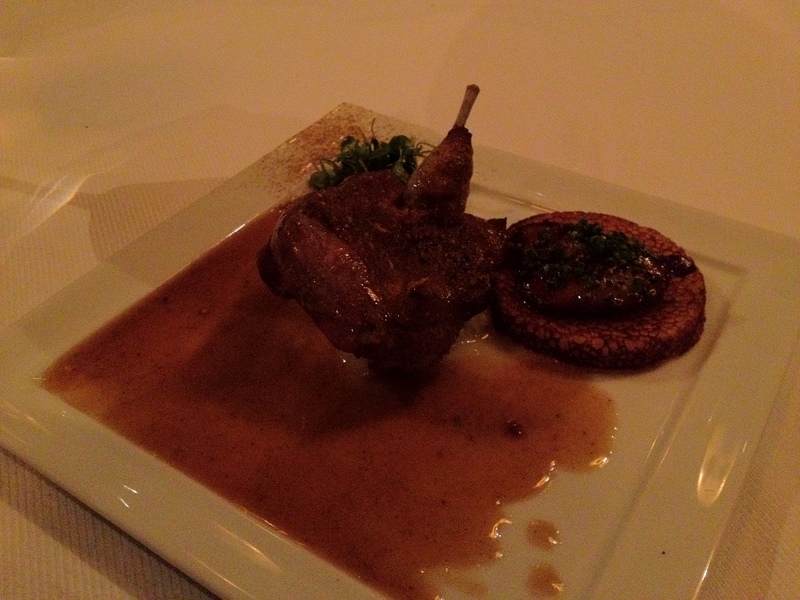 Broiled Squab, Onion Compote, and Corn Pancake with Foie Gras. The squab was good, but I felt that the real winner of this dish was the corn pancake with foie. That thing MELTED in my mouth; it had an intense flavor that went away all too soon :(. -Bottom Right: Mexican spice–flavored chocolate donut. -Top Right: Chocolate candy bar (I think that’s what he said…?) topped with gold and white chocolate. 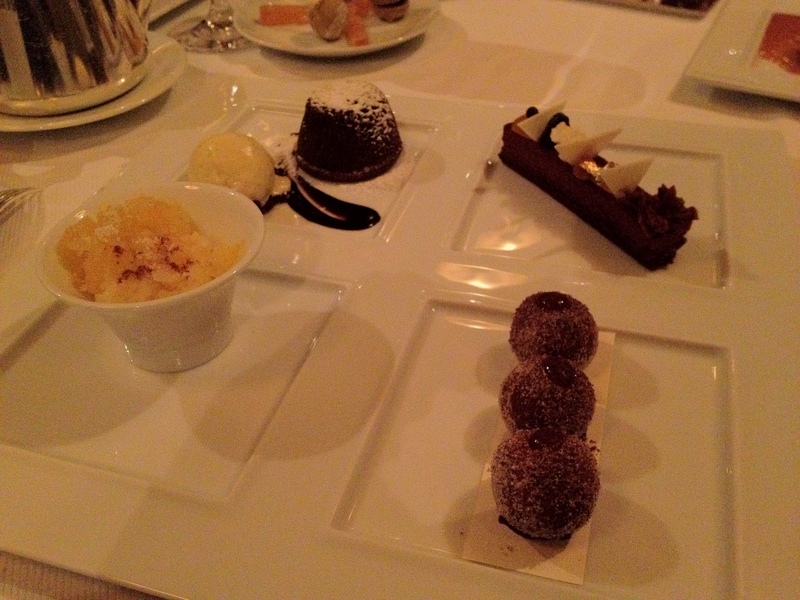 -Top Left: Jean-Georges’s Valhrona chocolate lava cake with vanilla bean ice cream. -Bottom Left: White chocolate meringue, meyer lemon ice, and cinnamon. The donut was really good and reminded me a little of getting churros with hot chocolate at Rick Bayless’s XOCO in Chicago. 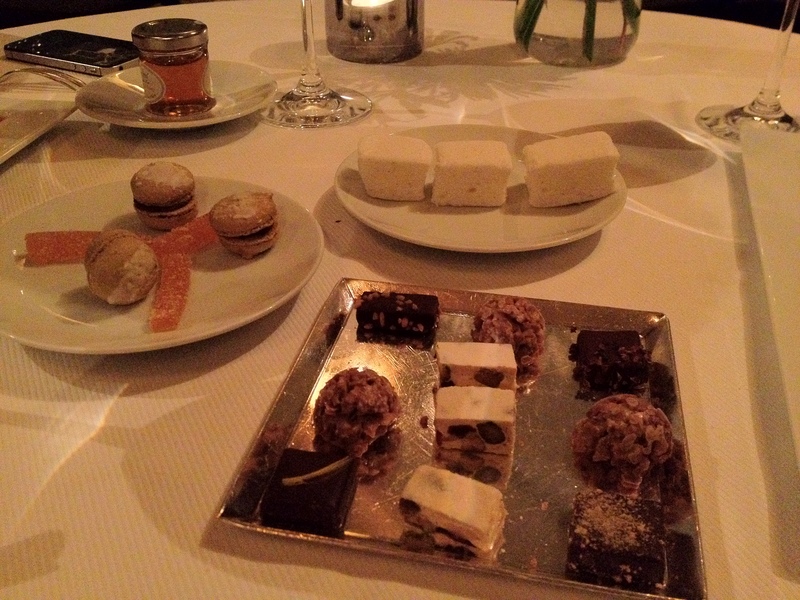 Both the chocolate desserts were rich and decadent; I actually liked eating them both at the same time. They were really rich in flavor, but they provided enough of a contrast that the chocolate lava cake ended up not being too rich for me. 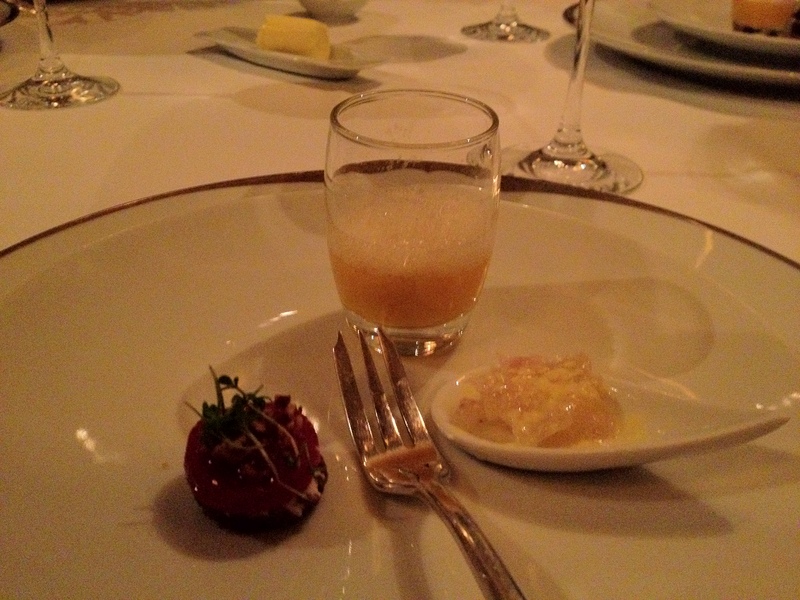 The white chocolate meringue and meyer lemon ice felt a bit out of place for me :(. It just wasn’t as good as the other three desserts! -Top and Bottom Middle: White cocoa with lavender (rice krispies!). -Candied grapefruit pâtes de fruit.